CarGurus has 1,635 nationwide WRX STI listings starting at $20,995. Subaru, though not exactly a household name when talking performance automobiles, nevertheless expects more road-rally success with its 2015 WRX STi. It’s agile, peppy, sort of stylish and boasts a few skin-deep changes. Unfortunately, it also fails to impress critics in the same way that its power-boosted WRX cousins do. In any case, perhaps the most obvious change to this compact 5-seat sedan is the deletion of the term “Impreza” before its model name. That’s right, the WRX STi, along with its WRX sibling, though riding the same underpinnings as their family-friendly cousin, stand as separate and distinct entities. Additionally, to the dismay of home-improvement mavens and voracious vacationers, the quasi-cargo-capable hatchback version is no more. However, a couple of added inches to the wheelbase for this generation means a tiny bit of extra rear-seat legroom, as well as marginally expanded trunk capacity of just over 12 cubic feet that’s now expandable with debuting fold-down rear seats. A slight shuffling of WRX STi trim designations is also on tap this year. The Base trim remains, while the once top-shelf Limited drops to the midlevel position as a limited-production Launch Edition, celebrating this sporty little sedan’s 10th year of existence, takes over the top spot for 2015. Meantime, in addition to its stretched-out wheelbase, the latest WRX STi is also slated to get an upgrade to its sport-tuned suspension, as well as a lighter frame and revised steering ratio for even more handling prowess. Further improvements include a pair of dashboard-mounted multifunction and infotainment displays, upgraded leather/alcantara upholstery, improved high-performance brakes and a flat-bottom steering wheel that complements a redesigned center stack. Fear not, however; full-time all-wheel drive (AWD) remains standard, as does the touted Driver Controlled Center Differential (DCCD), which allows more flexible management of said AWD system, and SI-DRIVE, which adjusts throttle response to suit the mood of the driving moment. Also returning in the 2015 WRX STi… seemingly to the dismay of more than a few reviewers… is the distinctive horizontally opposed 2.5-liter turbocharged 4-cylinder powerplant that gives the WRX STi its mold-busting pep. Its 305 hp and 290 lb-ft of torque now come managed by a brand new 6-speed manual transmission with a race-tested short-throw shifter that replaces last year’s 5-speed stick. Subaru still labels this blown 4-banger a boxer engine, while others describe it as a flat 4, but no matter the label, reviewers are scratching their heads over the fact that the lower-tier WRX packs a more powerful engine for 2015, while the STi variant stands pat. Anyhow, mileage figures are expected to remain in the vicinity of 17 mpg city/25 highway with the traditional variable valve timing (VVT). Bearing in mind expected tweaks for a bit more upscale ambiance, look for the 2015 WRX STi in all forms to retain its signature hood scoop and oversize rear spoiler, along with such trim-dependent amenities as heated front seats, full power accessories, including heated power-adjustable outside mirrors, cruise control and telescoping tilt-wheel steering and a power moonroof. Additionally, a rear-view camera now comes standard in all WRX STi editions, while the celebratory Launch Edition is delivered with gold forged aluminum BBS wheels and blue leather accents. Bluetooth hands-free communications are also expected to return in 2015 editions of this little screamer, as are dual-zone climate control and a single-CD player with 6 speakers, satellite radio and a USB port. A Harman Kardon 440-watt premium audio system with powered 10-inch subwoofer debuts as an option in all WRX STi variants, while GPS navigation (on a repositioned 6.1-inch LCD touchscreen), remote engine start and an auto-dimming rear-view mirror all return from last year. Finally, standard safety equipment is slated to remain 4-wheel antilock brakes with improved-for-2015 Vehicle Dynamics Control (VDC) helping out the standard traction control. Additionally, look for front side-mounted airbags, front and rear head airbags, daytime running lights, turn-signal-integrated mirrors and a remote antitheft alarm to grace all WRX STi trims for 2015. Optional safety features lineup-wide include front fog/driving lights and an upgraded antitheft alarm. What's your take on the 2015 Subaru WRX STI? 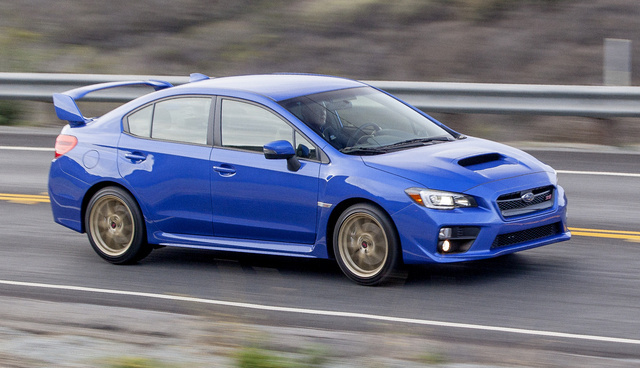 Users ranked 2015 Subaru WRX STI against other cars which they drove/owned. Each ranking was based on 9 categories. Here is the summary of top rankings. Have you driven a 2015 Subaru WRX STI? What Mods Should I Get First?? I have a 2015 Subaru WRX sti everything is stock except for my 10 inch subwoofer and other audio stuff my girlfriend bought and put in it. What other mods should i get??? Thanks in advanced! Looking For A Subaru WRX STI. How Do I Get You My Car Pics ?